I have added some red and brown tones at the bottom of the painting. It was quite tempting to keep adding more details but stopped myself in time before it got overworked. The male swan is called a cob and the female is called a pen, their offspring, cygnets. 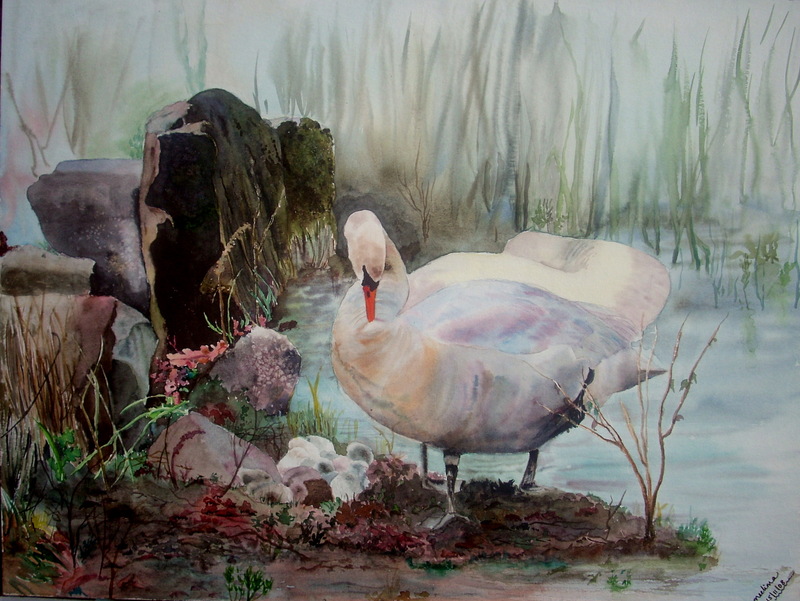 There are many types of swans – the mute swan which I have painted here has an orange bill with a black triangular shaped area in front of the eyes and a black knob above the bill more prominent on the cob. It is less vocal than the other types, hence its name but more territorial than the others chasing any intruders agressively many feet away from the nest. 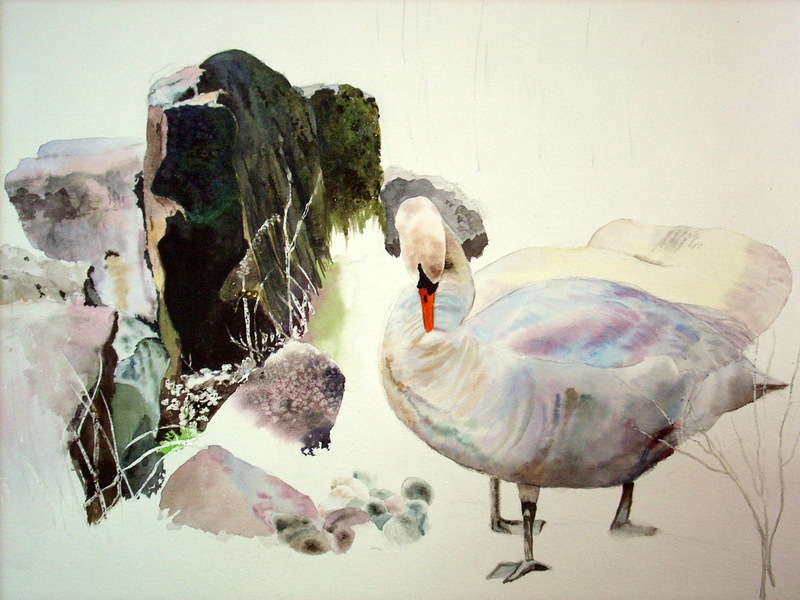 The trumpeter swan has a black bill and its neck is not as curved. 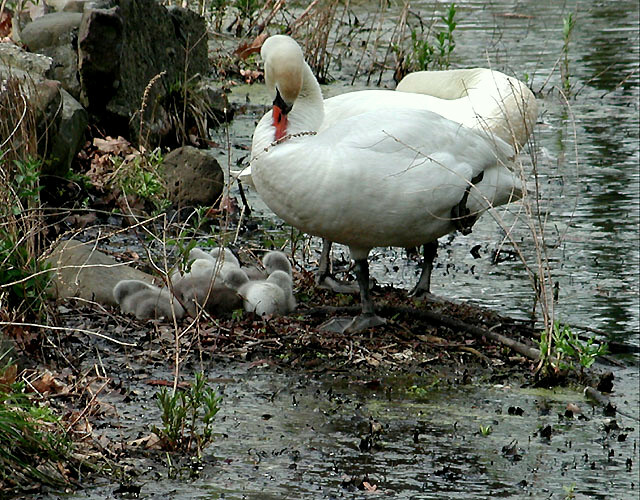 The black swan has a bright red bill with a musical call and is the most social of all during nesting and the cygnets sometimes ride on their parents back. The black necked swan has a black neck and bill and white plumage. The whooper swan is large with a deep honking call and is a powerful flier with a yellow and black patterned bill. This is the photo that I had used as a reference, thanks to ‘missmouse’ who had contributed in the reference image library of wetcanvas.com. And here is my version of it. 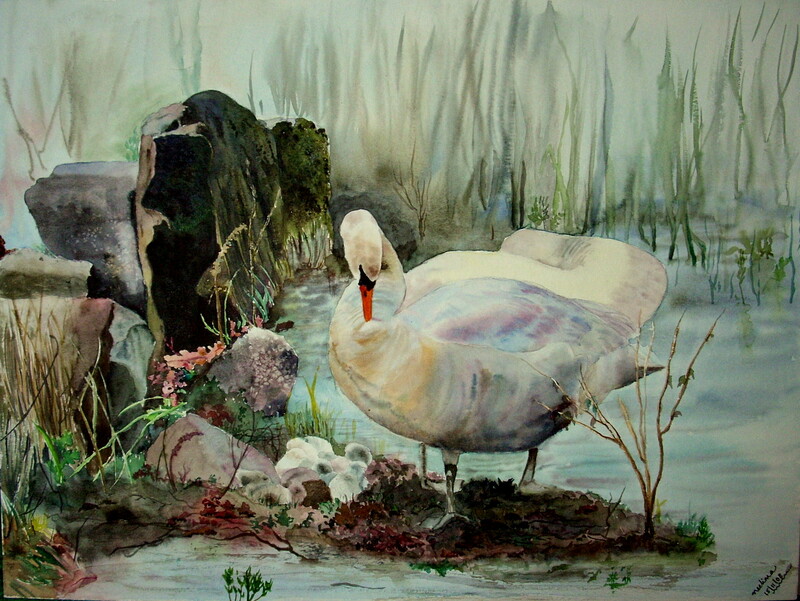 I made the rocks a little larger and put the reeds in the background in order that, there is a feel of a secluded niche` for the swan family. I think now though that, a little more earth at the base of the painting would give it more stability. One more step then…. 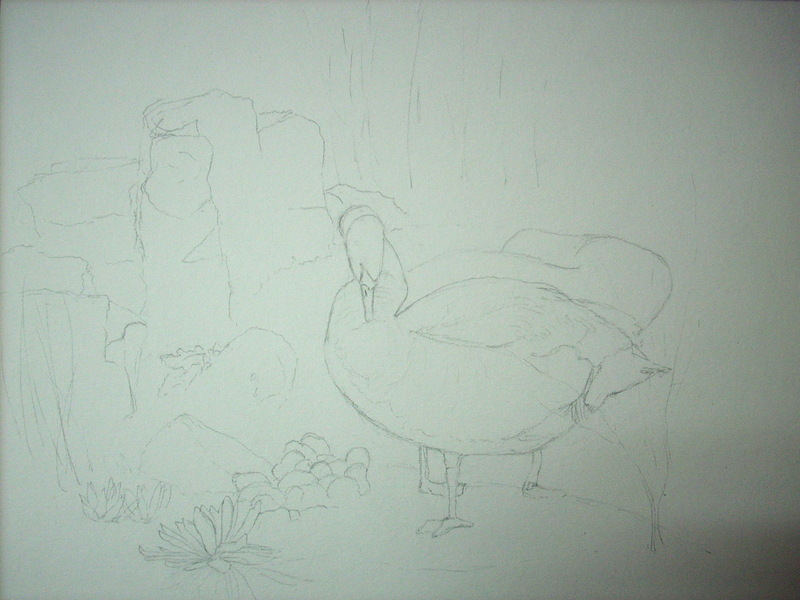 The sketch is just a quick outline with no details which I had posted previously (along with the washes for the swans). I was too eager to start on the colors. I think, this allows for more spontainety, with this painting I lost my fear of backgrounds and of making mistakes. Really, even splotches and cauliflowers can be made to look like textures. 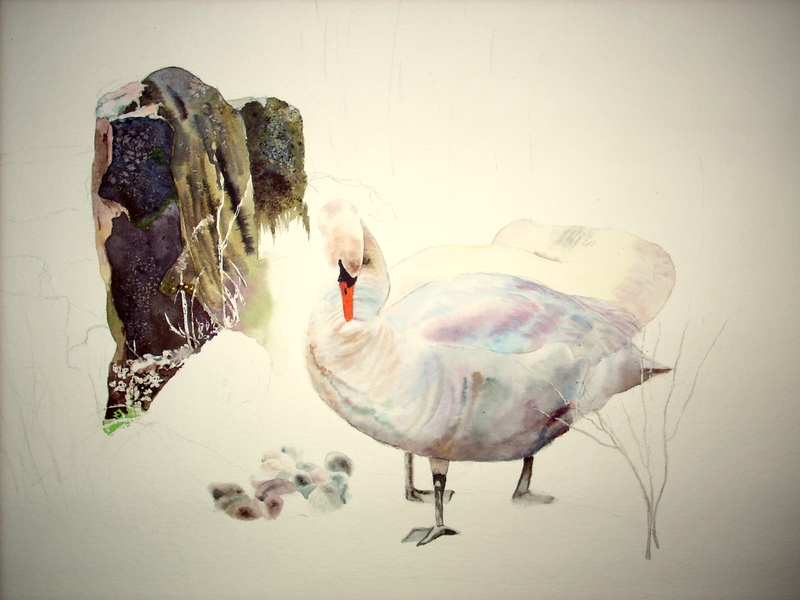 For the cygnets, I just wet individual areas and dropped in the same colors that I had used for the swans. For the rocks, I added other colors to the palette, usually I don’t use more than three or four but this time, I decided to break the rule and see if the painting still turns out harmonious. Scminke’s walnut brown is a color I like because it is opaque but still doesn’t look dull compared to the transparents. It is rich and thick and gets darker after drying, so I no longer have the problem I used to have in trying to get the ‘darks’ dark enough. 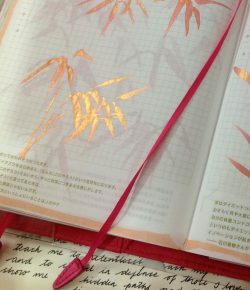 It also has a nice texture. Mixed it with a delft blue that I got as a sample and never used, which is also opaque to get the blacks. Other colors that I used are raw umber, gruen erde (green earth)( which is creamy and light valued and which I still haven’t figured out what best to use it for), green gold and sap green. Masked a few stems and leaves at the base of the rocks. Then, I dropped in light values of walnut brown, raw umber, sap green, krapprot tief (its a dark bluish red but still very bright) on a wet wash on the thin vertical strip of sunlit rock allowing the colors to blend. The top face of the rocks reflects the sky and looks bluish, so I dropped in weak mixes of pthalo blue and krapprot tief, again on a wet wash. The left portion of the rock is a little hollow and therefore in shadow, so I brushed in walnut brown and delft blue with a bit of sap green in the centre. While that area was still shiny, I sprinkled some salt. Wet the centre rock, and dropped in raw umber, weak mix of pthalo blue and krapprot tief and made streaks with walnuss braun. Soften the edge at the bottom with a damp brush. The rock at the right hand side is mossy and the texture looks spongy. Wet the area and dropped in most of the same colors, also adding green gold. Sprinkled salt evenly while it was still shiny. For the legs, layed in a weak gray wash made with pthalo blue and walnut brown, while it is still wet, moulded the form with a stronger color and after it got completely dry, drybrushed with the stronger color of walnut brown and a little delft blue. I let the whole painting dry thoroughly and brushed away the salt, which for some reason stuck resolutely and made hard white spots after coming off. This wasn’t the effect I was after, and I layed in deeper colors on the rocks, with just a bit of salt while it was very wet. As it was starting to dry, I stroked in lines with walnut brown and green gold. The other roacks are painted in the same way but in lighter values. The tops are kept bluish and lighter valued than the sides to give them form. Cracks are painted dry with the pre mixed brown black. I started on the foreground by first wetting the area, and laying in a mix of translucent orange and krapprottief and a small bit of blue. Also painted in some grass shapes in the left corner and some blue green for the water. A little red-orange-brown mix for the dried leaves. Let it dry and removed the masking. 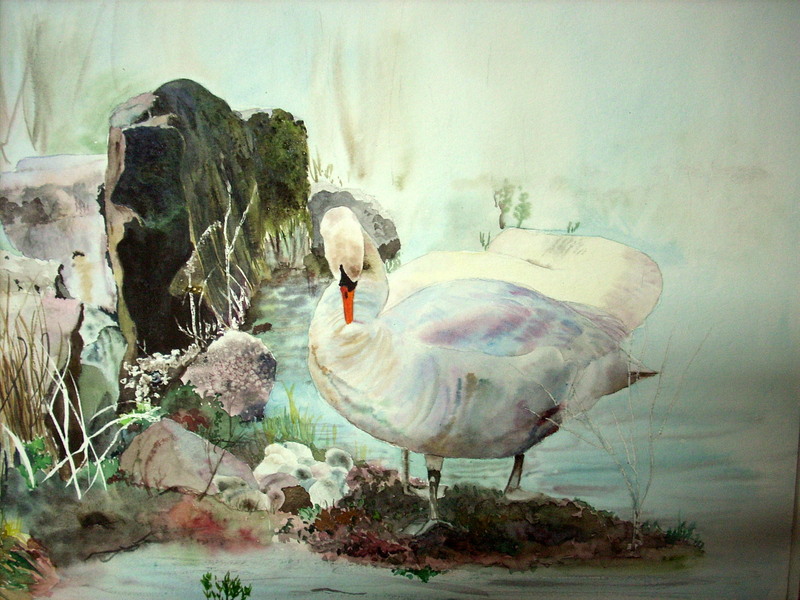 The area beneath the swans is a bit of earth covered with dried leaves, twigs all sorts of things, and I wasn’t sure how to go about it. It is in shadow, so I layed in darker values of the colors that I used before and made some leaf shapes with darker shadows underneath and some twigs. Wet the entire white area of the bg, and layed in pthalo blue. Painted small plants with a mix of pthalo blue and indian yellow. Painted the dried leaf on the rock with a weak mix of orange and red, then dropped in a little blue and brown and red for the shadows and the vein. Wet the bg again and stroked a few upwards strokes for reeds with blue greens and browns. 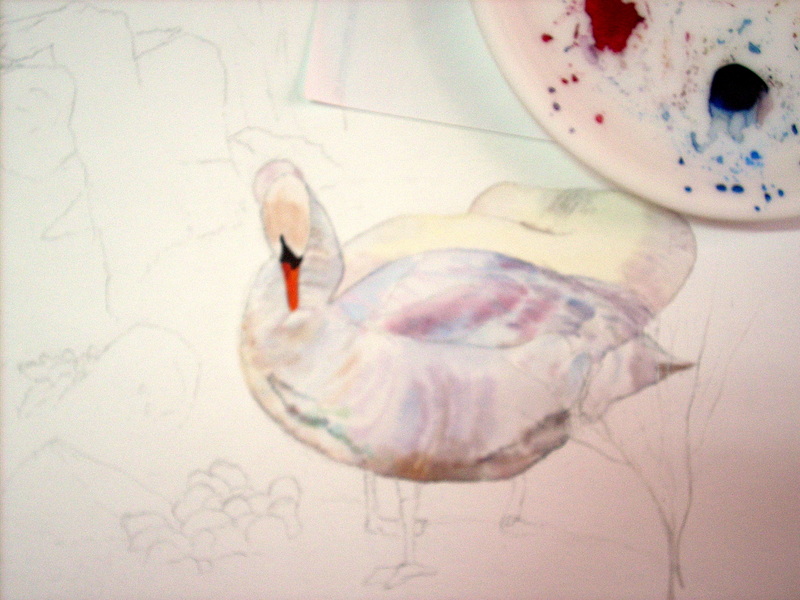 Worked on the swan a little to get more roundness of form. I had a lot of fun with this painting, this is the first time that I did rocks and used salt for texture. 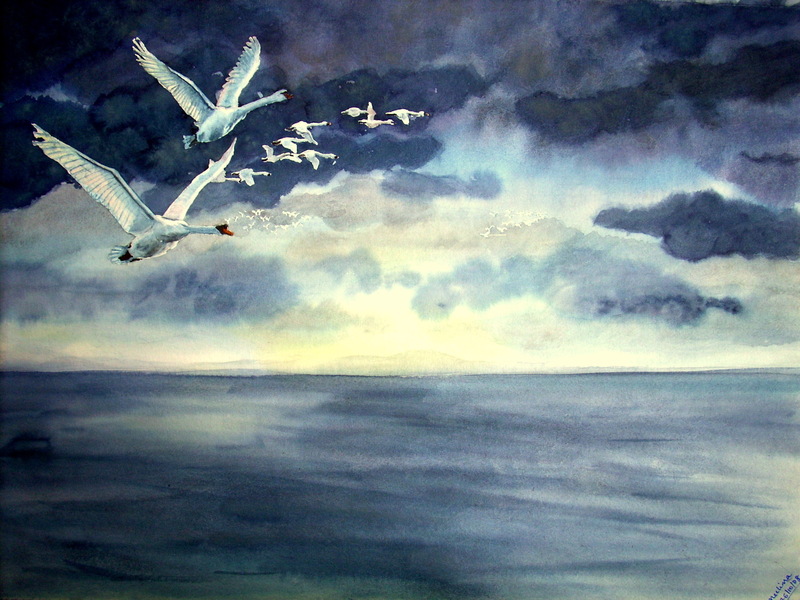 It got over quickly too, apart from the swans the rest of the painting took only a day, as my son was out most of the time with my mom. 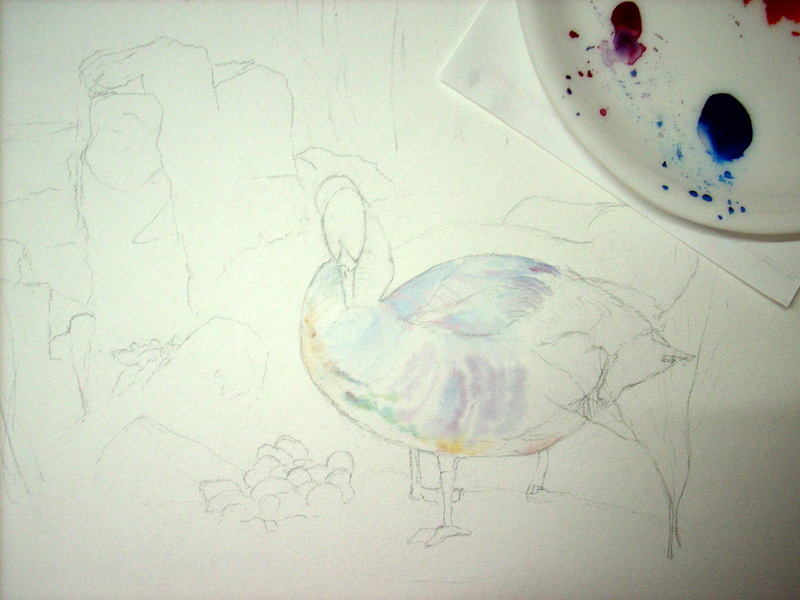 The colors that I have used are Schminke’s indian yellow, translucent orange, pthalo blue and krapprot tief. Masked a few stems. Wet the upper wing area and brushed in the blue and red, then wet the body area and stroked the same colors in curves to show the roundness of the body. I find this white round plate a lot more useful than the regular palette with wells. This allows me to mix many subtle variations of colors without the hindrance of wells. The whiteness of the plate also helps me to see the mixes without testing them first on a swatch of paper. For large washes, I bought another tray with 3 divisions and a couple of white shallow dishes. Painted the head with a mix of the orange and the blue on a slightly wet area, taking care to leave white edges. The black is a mix of all the four colors. 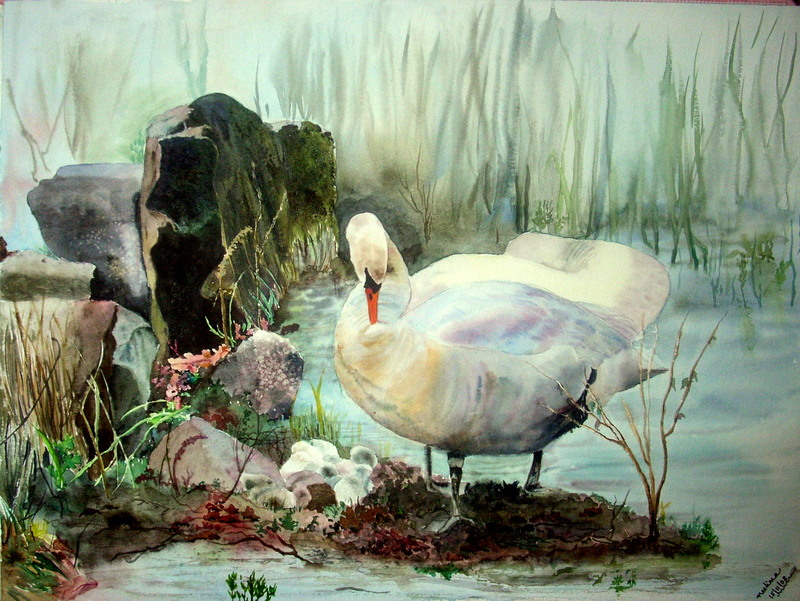 The cob (male swan) behind the swan is in sunlight and painted with a weak wash of indian yellow. While this is still wet, I sroked in a mix of red and blue for the shadow at the right hand side and a grey mixed with red, blue and yellow at the neck area. 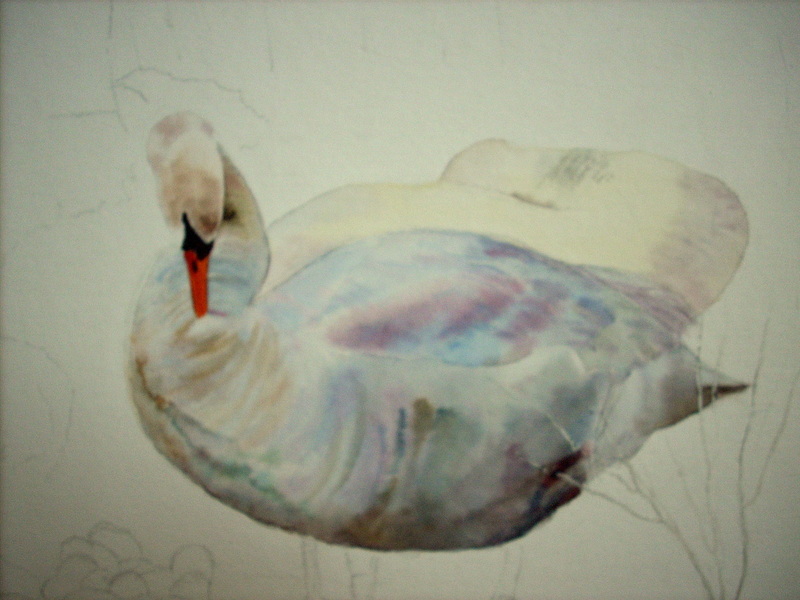 Deepened the colors and added shadows along the belly of the swan. 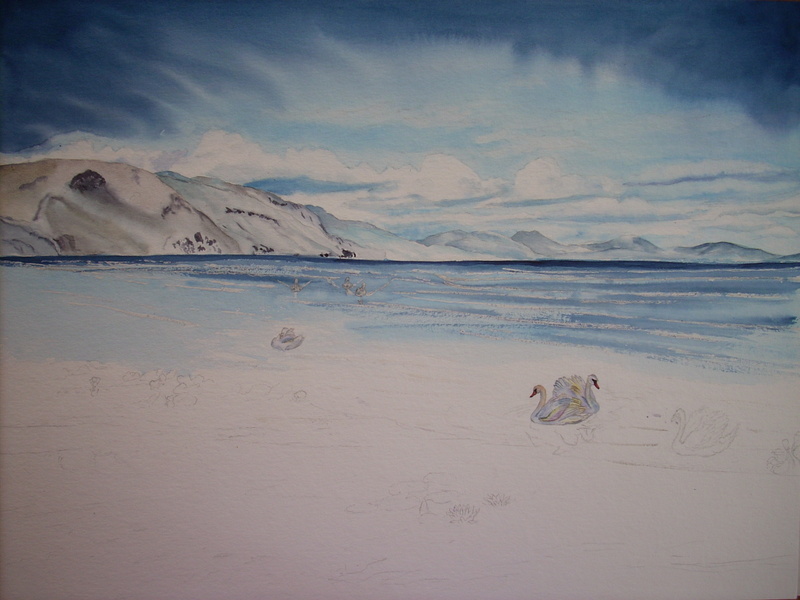 I have decided to leave this at this stage and move to the rest of the painting before adding any more details. The photos have been taken at different times in different lights, hence the difference in colors. The background is still white in all 4 photos. Here’s the sketch I made for the last painting in this series. The reference image is from the RIL of wetcanvas.com (thank u ‘missmouse’). Its such a beautiful scene of the parents preening and looking after themselves after the cygnets have just hatched. Initially, I wanted this painting to be very colorful with a number of lotus and water lilies but later decided that it would just distract attention from the quiet touching beauty of the scene. 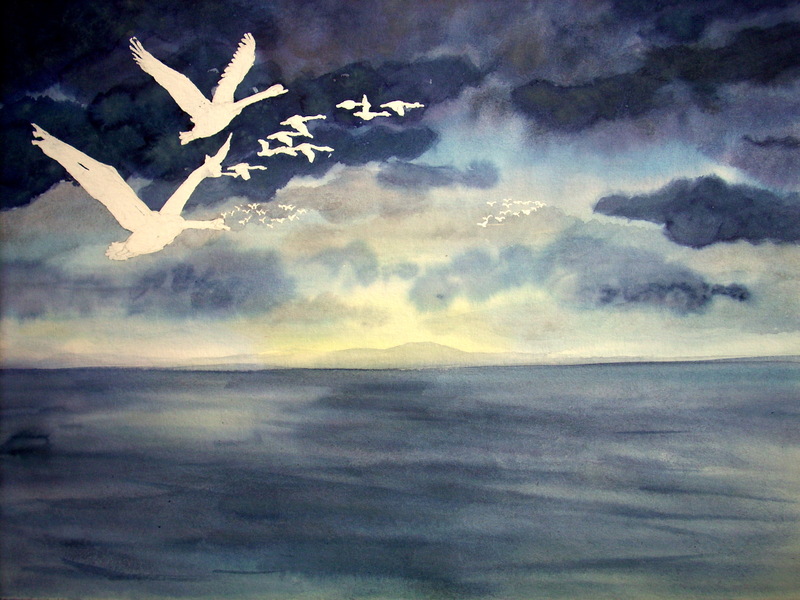 Something about the long distance perilous journeys that migratory birds take struck a deep chord in me, making me want to paint them in a stormy sky setting. 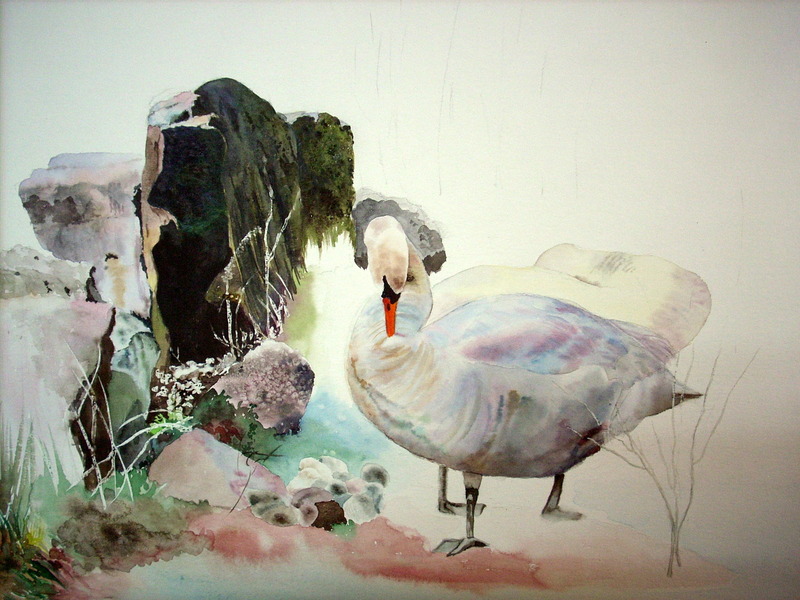 Thinking of swans, I soon realized that one scene wouldn’t do them justice and so I have started on a three painting series on swans. Swans generally mate for life. They breed in the summer and return to the same nest every year. The nest is built on a mound surrounded by water. They migrate with their young ones for winter to fresh water lakes and ponds near to constant food supply areas like agricultural fields. The bar headed geese are migratory birds that fly upto 27,000 feet which makes them the highest altitude migrants. Every spring,they fly from their winter feeding grounds in India over the Himalayas to their nesting grounds in Tibet. 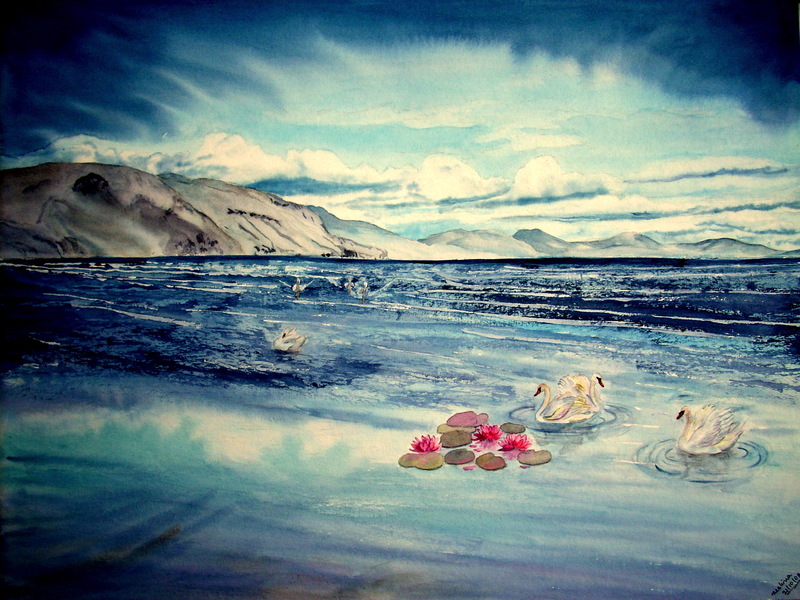 This first painting is a peaceful scene of Mute swans on the sacred Manasa sarovar lake near Mt. Kailash, the heavenly abode of Lord Shiva in the Himalayas. Here is the sketch I made by combining elements from many photos.